Gold miners around Charleston worked ancient marine sandstone with finely dispersed gold. The sand is cemented with iron, so the miners used crushing equipment developed for quartz mines to crush the sand and recover the gold. 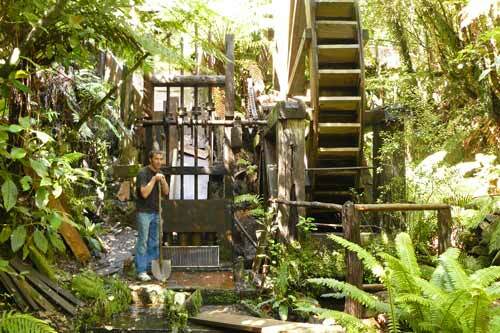 Mitchells Gully gold mine is a partly restored mine run by descendants of the original miners. This crushing battery is powered by a waterwheel.